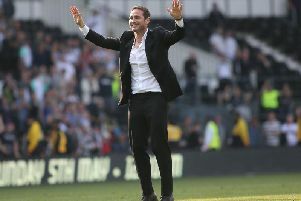 Jose Mourinho has backed Frank Lampard’s Derby County to maintain a Championship promotion fight. The Manchester United boss - and Lampard’s former manager at Chelsea - was speaking ahead of their first meeting in opposing dugouts. The Red Devils host an in-form Rams side tonight (Tuesday 25th September, 8pm) at Old Trafford in the third round of the Carabao Cup. And Mourinho spoke of what he expects from a Derby side managed by his former midfield magician. “I don’t consider them favourites because it is really hard to do that in the Championship – it’s such a difficult competition and it’s becoming a good competition, with so many good teams, that it is difficult to qualify and say this team is a candidate,” Mourinho told manutd.com. “But I think when Frank (Lampard) goes there he goes with the intention of being promoted. He has experienced players, he has good players coming from good academies like Chelsea and Liverpool.